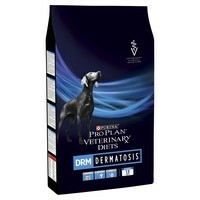 Purina Pro Plan Veterinary Diets DRM Dermatosis Dry Dog Food is a complete veterinary diet for dogs of all ages to help nutritionally manage skin conditions. Purina DRM contains specific nutrients that promote a healthy skin texture and coat, and help support your dog’s immune function, such as high quality protein, zinc and antioxidant vitamins. High levels of Omega-6 fatty acids in the formula also help to support the skin’s natural barrier function, while increased levels of Omega-3 fatty acids help to enhance the natural anti-inflammatory processes.